Above the tech shed at a Florida short track reads, “It is what it is.” It’s a response to all of the teams leaving that brightly lit awning boasting a few less titles than they entered it with, after failing one of the most meticulous technical inspections around. 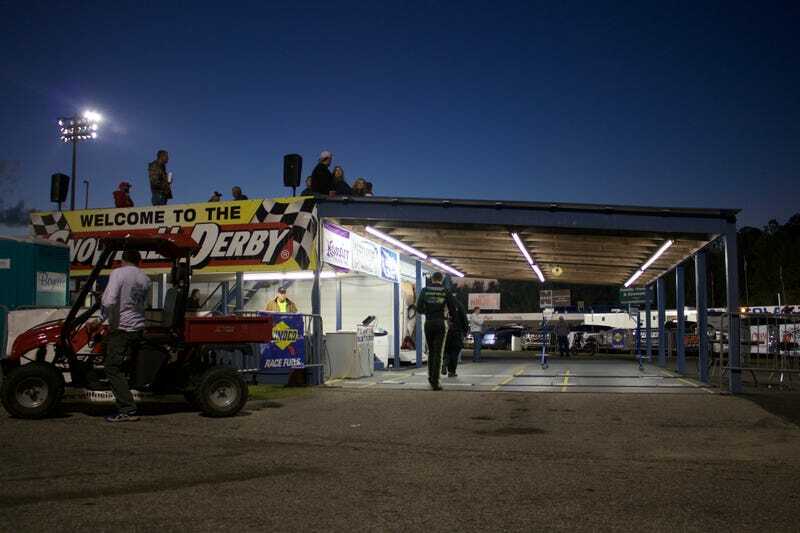 That tech shed resides at Five Flags Speedway, home of the annual Snowball Derby Super Late Model race. Drivers come from all over the country to compete in Pensacola, Florida on the first weekend of December, and the last 10 years of the event have seen four drivers—including Kyle Busch Motorsports driver, Christopher Bell, in his race debut last weekend—cross the line first and have their names peeled off of the trophy in post-race technical inspection. And that leads them straight into Brooks’ backyard. Gates guard the shed, keeping the audience back while inspections occur. Teams, drivers and fans look on, waiting to hear the word. Usually, bad news comes by a hushed delivery as the crowd tries to decipher the scene. Being declared the winner in tech, however—that’s far more of a triumphant occurrence. With that, let’s take a look at all of the drama that goes on at and around the shed. Welcome to competition at the Snowball Derby, folks. As employees opened the gates holding off the crowd around the tech shed last weekend in preparation for the unofficial race winner, Bell, to exit, one of the Kyle Busch Motorsports guys turned around to leave. Bell hopped on out of the car, walking over to discuss what happened with his team. After qualifying on the unofficial pole for the Snowball Derby with a new track record at 16.027 seconds just two days before, Bell received an additional disqualification for too much space between the center of the wheel and right-rear quarter panel. The pole position and record went to second-place qualifier Ty Majeski, while Bell went to the back of the last-chance qualifying race. But that didn’t stop him from winning it. With his climb through the field in the qualifier, Bell started in 31st position in the 37-car field on Sunday. Just like in the last-chance race, the crowd watched Bell sail through the field. And with the way Bell drove past former winners Chase Elliott and John Hunter Nemechek once he entered the top five, you would have thought the two were driving cars with the same horsepower as Fisher-Price toys. But after posing in victory lane and hoisting his new Tom Dawson Memorial Trophy, the verdict on Bell’s No. 51 car wasn’t what he wanted to hear. Before a crowd could form around the unfolding drama, Bell took the chance to talk to a couple of his crew members. With Kyle Busch Motorsports’ roots in the NASCAR ranks, Joe Gibbs Racing shirts can even be spotted at the race. The crowd didn’t take long to begin arriving at the car. Word spread, and others waited around the tech shed to see what would become of the other top finishers. Bell darted off in the other direction before the camera crews made it over, and he can’t really be blamed—his weekend was over. It was onto the second-place finisher and Jeff Gordon’s successor in the No. 24 car for 2016, Elliott, at the tech shed. But Elliott knows what it’s like to be in Bell’s position. In 2013, illegal tungsten found in the No. 9 car rendered Elliott disqualified after dominating the field and crossing the line in first. As ironic as it is, Elliott’s disqualification handed the win to Kyle Busch Motorsports driver Erik Jones. This year, the teams switched places in Brooks’ infamous ladder of illegality. Though his car was long gone from the tech shed, the Snowball Derby trophy still had Bell’s name on it—for the time being. As Bell said about his disqualification from the pole position, “That was short lived.” Notice some on the names that Bell almost joined on that winners list. With all of the focus on Elliott, officials pushed the car of the original third-place finisher Zane Smith to the side. If Elliott met the same fate in post-race tech as Bell, it would be onto Smith for a verdict on the winner. By this time, Bubba Pollard—who initially crossed the line in sixth—joined the crowd at the tech shed. At the rate things were going, he might have needed to dig his car back out to go through inspection. The remainder of inspection dragged on with anticipation, but it was just one hour later—almost to the minute—that officials peeled Bell’s name from the trophy to plaster that of the new winner, Elliott, on. Deemed legal enough to hold it, the trophy went straight onto the roof of Elliott’s car. And the cameras crowded around. Almost two hours after taking the checkered flag at the 2015 Snowball Derby, we finally had a winner. And it wasn’t the one we saw take the checkered. After tearing the car to pieces in order to prove its legality, fans now knew that the car in their photographs was the winner—not the next victim in tech. Things calmed down at the tech shed, and Elliott hoisted his trophy after completing interview duties. As he lifted it over his head, perhaps forgetting that he won the race in the tech shed rather than on the track, Elliott accidentally rammed the Snowball topper into the ceiling. Oh, well. What’s a scratch going to do? He passed inspection—that’s all that matters. A good portion of the crowd stayed around to see it unfold, but those who headed for the gates at the checkered flag would just have to hear of the new winner later. Elliott went back out onto the frontstretch before empty grandstands, recreating the victory-lane photos Bell had taken just a few hours before. Elliott didn’t cross the line first, but Brooks deemed that he crossed it fairly. And around here, that’s just what it is.